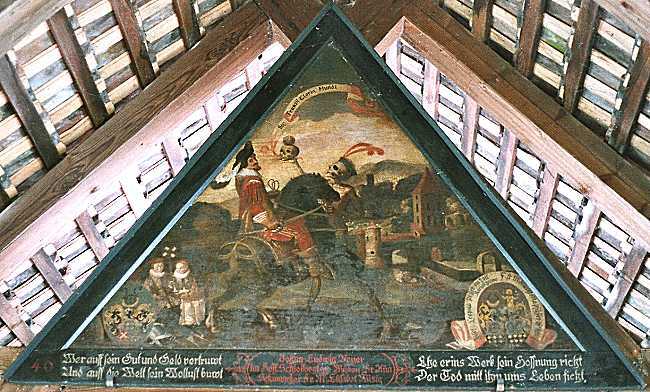 Like the even more famous Chapel Bridge, Spreuer Bridge is an old, covered wooden bridge with ancient paintings under its roof, representing a Dance of Death. Spreuer Bridge also served as part of the medieval city fortifications. Spreuer Bridge seen from Nölliturm (lower end of the medieval city). Next to the bridge, on the upper side, you can find the Nadelwehr: wooden water spikes [they call them Nadeln = needles] are still being used to regulate the level of Lake Lucerne and to feed a modern hydroelectrical power plant. The original Spreuer Bridge was erected around 1400 (first mentioned in 1408), but destroyed by storm in 1566, and rebuilt in 1568. The small chapel on the bridge also dates back to 1568, it has been renovated in 1889. An older small bridge at the location connected Mühlenplatz [Mill's place] with the city mills built on a small island in River Reuss already in the 13th century, however. The 1408 bridge was built to connect the mills with the baker's quarter in Pfistergasse [Pfister = medieval German word for baker] on the left bank of River Reuss. 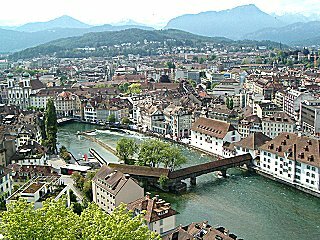 While the major part of medieval Lucerne is located on the right bank of River Reuss, the bakers had to stay on the left bank because they kept the fire in their stoves alive during night. The fear that fire might destroy the whole town was not unrealistic, in fact there are no old wooden houses left within the old town of Lucerne, the exceptions are located just outside the medieval ramparts. What is the meaning of the name Spreuer Bridge? Spreuer Bridge is situated at the lower end of medieval Lucerne. Though medieval towns in Europe were known to be quite filthy and sophisticated Roman sewage techniques had been forgotten over the centuries, they still made some elementary provisions to restrict immissions. 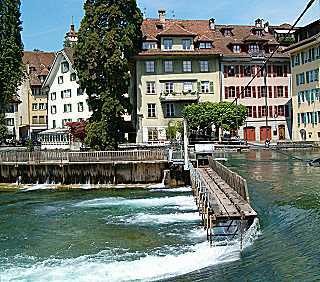 In medieval Lucerne, it was allowed to throw Spreu [chaff] into River Reuss, but only from this lowest bridge in town. The city mills were destroyed in 1875 by fire. Instead, turbines were built and used to drive a variety of machines. But 50 years later the mechanical transmission of power was outdated and replaced by an electricity generator. In 1998 the power plant was completely redesigned and equipped with the latest technology available, delivering 4.3 million kWh per year (which equals the consumption of about 1,500 households in Lucerne). So you can find here a well-preserved example of 16th century art of engineering next to state-of-the-art 21st century technology. 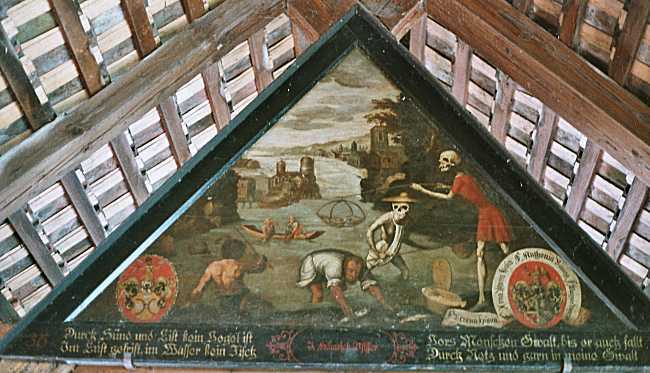 Under the roof of Spreuer Bridge, 67 paintings dating from 1626 to 1635 represent a "Dance of Death". 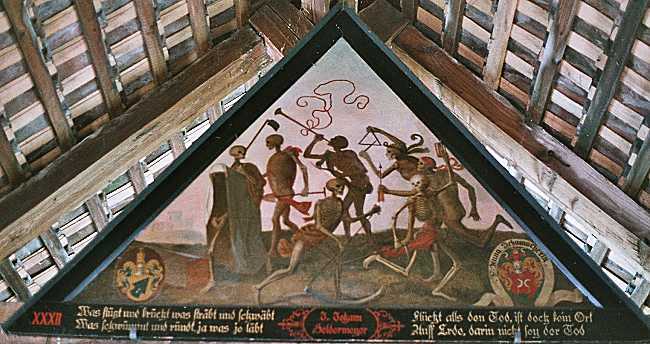 Death, represented as a skeleton or as the "Great Reaper" urges everybody to dance with him, i.e. to die. Death makes no difference between old and young, churchmen and laymen, rich and poor. 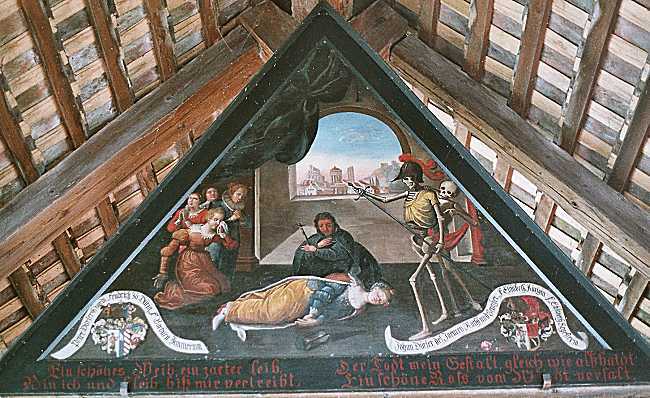 This kind of paintings were often placed on cemetary walls. They expressed people's feeling in the face of death especially during times of epidemic pestilence and were widespread all over late medieval Europe, but only very few examples have survived to date. The fascination for this theme has not completely gone, however, as the dedicated German website www.totentanz.de shows. 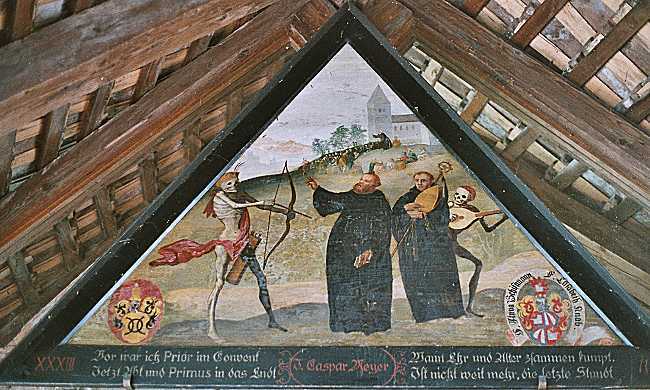 Lucerne's Dance of Death was designed by chief painter Kaspar Meglinger.